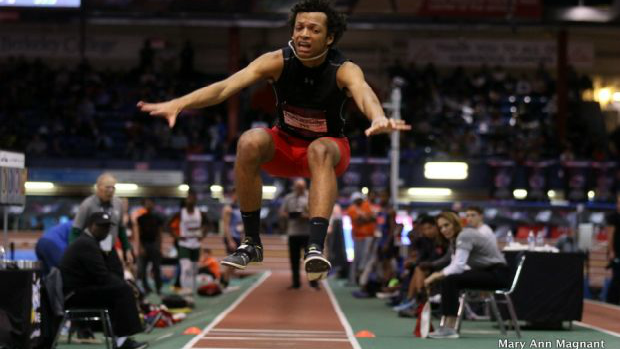 The first day of competition inside the Armory for the New Balance Nationals Indoor was as tough as it has ever been. The emerging elite competition used to be hailed as an easy medal grab and neighborhood bragging rights for the next up and coming track and field athlete. This is no longer the case as entry standards have stiffen as well as "above average" national level athletes have the option of making a name of one's self and being immediately noticed by peers and potential college recruiters. Several prominent and emerging Illinois athletes took advantage of the first day of competition to get themselves acquainted with the massive arena, environment and competition. 60HH: Kayla Walters (Bolingbrook) grabs a personal best and improves to IL #2 8.85 but just misses the final by .02. She was disappointed in the placement, but vowed to be ready for the June outdoor version. "I'm coming back strong for outdoor NBNO," she said. Walters teammate Katelyn Johnson was also in the event. She ran 9.19 and stays in the #9 slot in Illinois. 800: Marne Sullivan (New Trier) and Arielle Summitt (Urbana University) improved on earlier season marks. Sullivan in particular has had a quiet but solid season. After running winning her section and dropping an IL #4 2:14.97 6th place finish, it appears as though the previously seasoned 400m runner may have a home in the "half-mile." Sullivan only ran 2:20 outdoors last year in minimum action. Summitt fought back in a tough opening section that produced the overall winner in 2:13.67. Summitt closed hard to placed 4th in her race (2:15.86) and run the 5th fastest time in the state. LJ: Raelyn Roberson (Glenbrook South) had a tough time only jumping 17-0.75 for 21st place. A positive light should for the sophomore is that she gained very valuable meet experience for the future. PV: Rhiannon Held (Mt. Zion) placed 11th with a personal best 11-8.5 which is now the 4th best effort in the state. The freshman Held attempted 12-2.5. Kolby Weiss (Clinton) jumped 11-2.5 but did not improve on her season best 11-8. TJ: Peyton Frankenreider (Yorkville) busted out in a big way after enduring an average season to date. Keep in mind that Frankenreider competed earlier in the week at the DGS Relays and was a part of the 4x200 follies. But a third place and big two foot personal best 46-8.75 is a welcome relief as well as Illinois #2 mark.